Every skincare product makes some kind of lofty promise, but this eye serum really does help lessen dark circles. It has caffeine, which stimulates circulation and detoxification and limits the fatty deposit and milia that can form in the eye tissue. Sorry, our try me size is not available. Pila’s Tip: This is my one of my all time favorite products: I realized how effective it is when I forgot it once on a trip and could not believe the return of the dark circles under my eyes. You can use this morning and night, and in fact, you should! 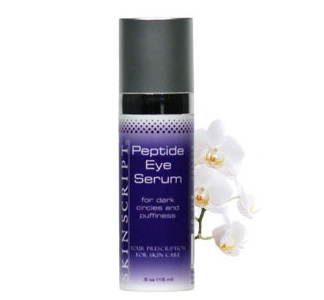 The Peptide Eye Serum opens the eye zone for a refreshed, youthful appearance. It brightens the appearance of discolorations, reduces the appearance of wrinkles, stimulates circulation, and improves tissue strength while encouraging healthy cellular skin functions. Uses three peptides and caffeine to reduce inflammation while phytic and tartaric acid gently exfoliate to move dark pigment out of the eye area. Perfect for dark circles and puffiness. Recommended for concerns with dark circle and puffiness under the eye. Directions for use: After cleansing and toning apply under the eye morning and night. Follow with moisturizer. • Eyeliss™— a combination of Palmitoyl Tetrapeptide-7, Dipeptide-2, and Hesperidin Methyl Chalcone. It helps prevent and reduce puffiness under the eyes. • Haloxyl™— a combination of Chrysin, Palmitoyl Oligopeptide, and Palmitoyl Tetrapeptide 3. It reinforces firmness and tones up the eye area. It also facilitates the elimination of blood pigments responsible for dark circle coloration and inflammation. 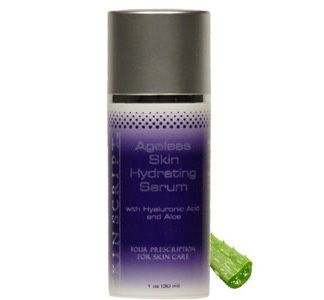 • Argireline® (Acetyl Hexapeptide-8) is a powerful anti-wrinkle hexapeptide to relax facial tension, leading to the reduction of facial lines and wrinkles. • L Ascorbic Acid— improves skin elasticity, decreases wrinkles by stimulating collagen synthesis, and suppresses cutaneous pigmentation. • Phytic Acid— a natural antioxidant, extracted from wheat and rice and has a powerful chelating effect on iron. It provides gentle keratolytic effects and aids in cell turnover. • Tartaric Acid— improves skin texture and tone. It is an AHA derived from grapes that forces exfoliation and cellular renewal, softens the skin, and removes keratinization. • Caffeine— stimulates and promotes healthy detoxification. • Spin Trap (PNB)— entraps reactive oxygen species to restore proper chemical structure and spin to destructive molecules. It limits lipid peroxidation and free radical damage.